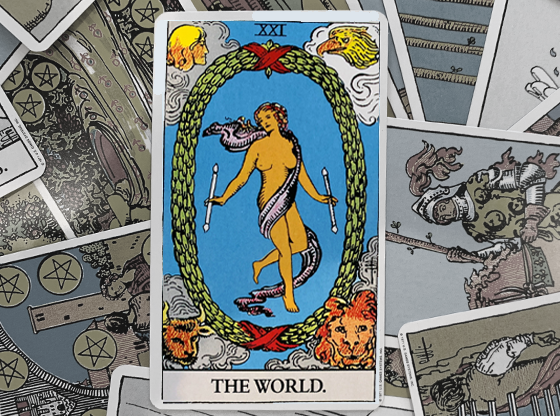 A blue sky with four clouds, one in each corner, sets the scene for this most mystically illustrated of all Tarot cards. In the center is a large bronze disc illustrated with letters and arcane symbols. On the top of the disc there rests a blue sword-bearing Egyptian sphinx staring straight at us. Below him, rising up counterclockwise is a red humanoid body with what appears to be a hairless wolf’s head. Heading down the left side of the wheel is a golden snake. Each of the four clouds hosts a winged animal reading a book. There is an eagle in the upper right corner, a winged lion below him, a winged bull in the lower left, and an angel above him. Starting at the top and moving clockwise, the letters on the disc spell: T, A, R, O … with the word TAROT forming when you return to the spot where you started. The four corners are occupied by the symbols for the fixed signs of the zodiac. 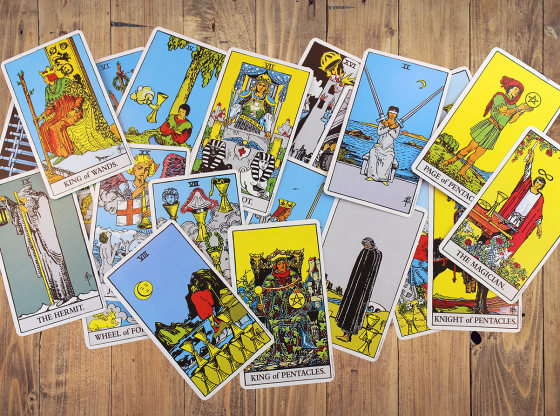 Tarot cards borrow illustrations from many traditions and the zodiac is among them. The lion is Leo and the bull is Taurus, the angel represents Aquarius and the eagle is the higher echo of Scorpio. The sense of destiny is confirmed in fixed zodiac signs as these are personality types that hold steady toward the inevitable. The Sphinx on the top of the wheel represents life’s riddles. The snake is a reference to the tree of knowledge from which the snake tempted Adam. The red humanoid figure with the dog’s head seems like some ominous demon, but this figure represents our shadow side, the inner animal we must confront as we evolve. And so the riddle encircling the wheel is to know ourselves in order to maximize the whims of fortune. 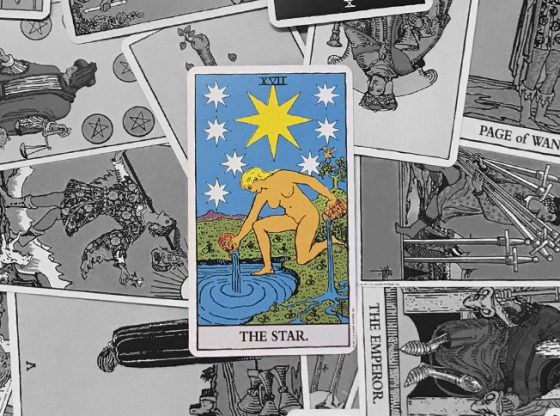 In a Tarot reading, the cards are laid out in front of you with specific placements. Where a card lands indicates your past, your present or your future. 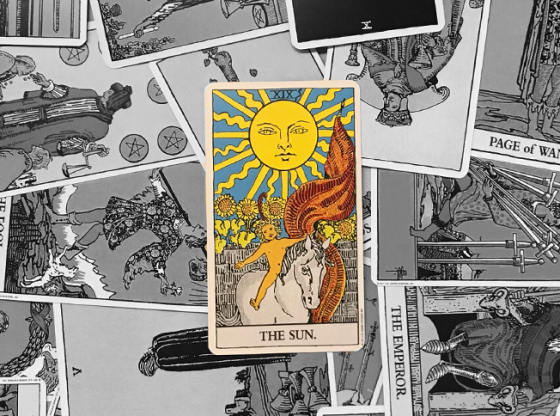 The past position represents the foundation of where you are now, as past events created the present reality in which you are receiving your Tarot reading. In this position, the Wheel of Fortune represents the big changes in your past that altered the course of where things were going. This could refer to the divorce of your parents, the end of an important love relationship or other equally momentous events in the past that have blazed the trail on which you now walk. 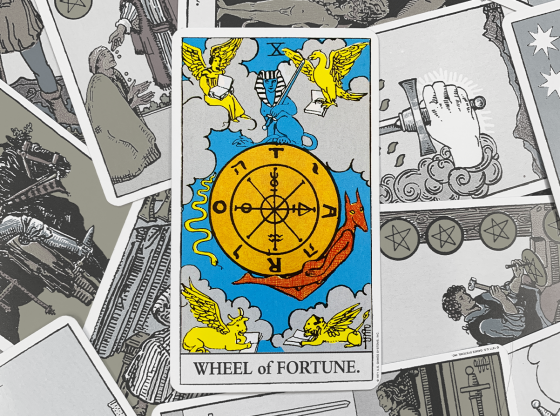 The future is also a great place for the Wheel of Fortune to appear in your reading, although the change ahead that it signals could be disruptive and unwelcome. If you are happy with the stability in your life right now, the Wheel of Fortune card in the future position reminds you that this too shall change. How, when and why may be revealed in some capacity by the other cards in your reading, especially those touching the Wheel of Fortune card. If life is tense or uncooperative at the time of your reading, the presence of this card off in the distance of your journey through life should be an inspiring reminder that this too shall pass. 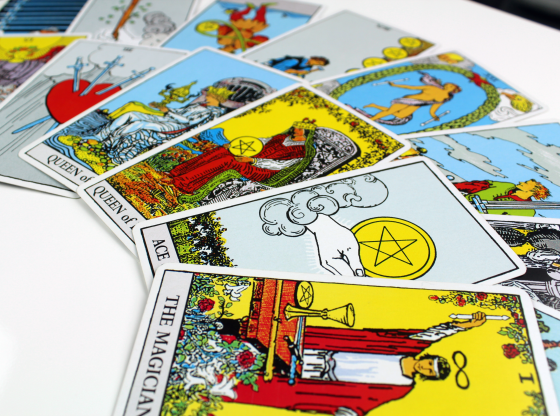 When you receive a Tarot reading, the many cards spread out all influence each other. The presence of one card can change the meaning of other cards, and they all have an effect on that one card as well. The Wheel of Fortune is card number 10 in the deck. 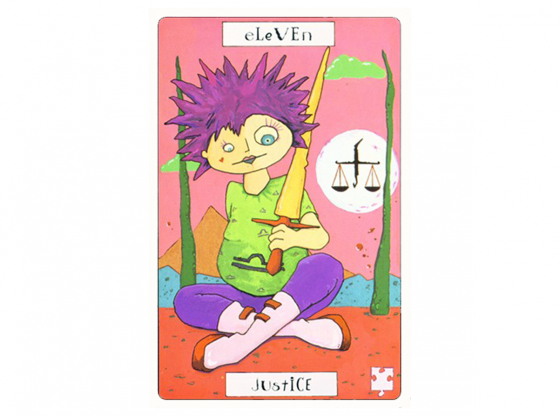 It is related to card number 20, Judgment, and to card number 0, The Fool. When either of these cards also appears in the reading, a clearer idea of the changes ahead emerge. Judgment represents absolutes coming from the turn of events. The Fool, meanwhile, represents immunity from having anything harm you when the forces of change occur. When The Emperor appears in the same reading as this card, your relationship with an authority figure will change. 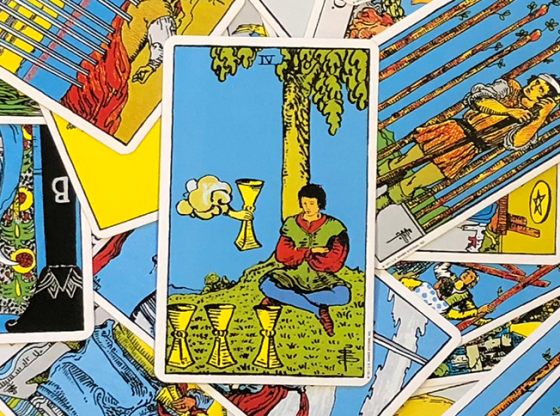 When The Hermit is in your reading with the Wheel of Fortune, expect to either be alone soon if you are in a relationship, or to be getting together with someone new if you are single and have no prospects. 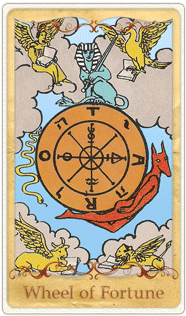 The Devil card in the same reading as the Wheel of Fortune indicates that you are going to be paying dearly for pursuing pleasure at the expense of your responsibilities. 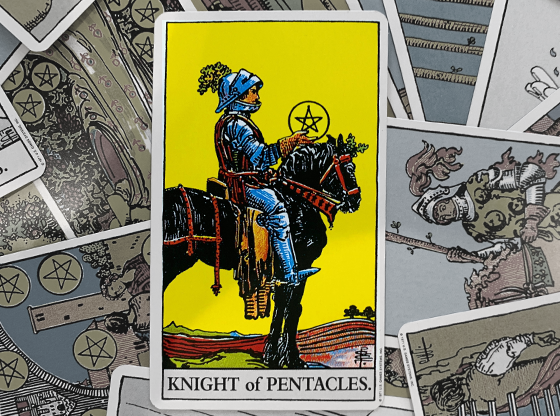 Temperance is a card that goes well with the Wheel of Fortune, as it indicates the peaceful outcome of change in your life will be beneficial over a long period of time. 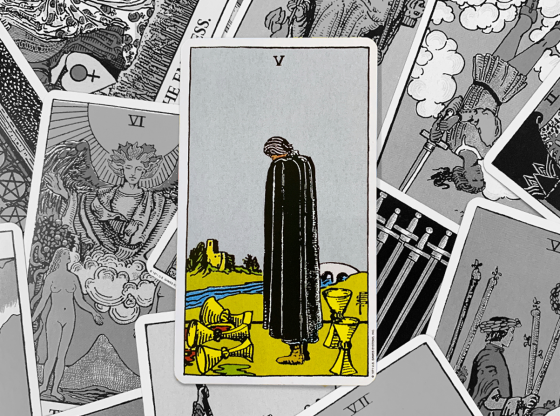 If you discuss your Tarot forecast in depth with your Tarot reader, be sure to examine your motivations in the answers you seek. The Wheel of Fortune delivers great things in the areas of your life in which you are the wisest.